Macworld took possession of an iPad Thursday morning, and for the last few hours we’ve been poring over it, taking photos and screen shots, trying out accessories, and tapping through every app on the device. We’ve got a long way to go and a whole lot of questions to answer. But here’s a quick take with some initial thoughts on this new device. First, the screen: It’s big and bright, with vibrant colors that can really take your breath away. When we launched the third-party Epicurious app, the bright red splash screen was shocking; the colors on the in-beta Marvel Comics app were similarly impressive. The iPad’s screen doesn’t feel like a laptop screen ripped away from its keyboard; it definitely feels more like a big iPhone screen. In a good way. People who say the iPad is dumb because it’s just a big iPhone are missing the point—that expanded real estate changes everything. 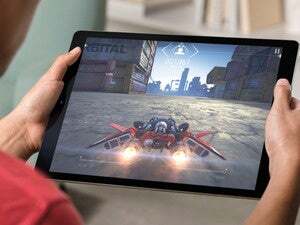 Instead of having to go the iPhone route and cram everything into a series of back-and-forth, drill-down-then-pull-back-up screen stacks, iPad apps have room to breathe. Many of them display a split-view in landscape mode, with content on the right and an index of items in a column on the left. The new “popover” interface convention and added items on toolbars increase functionality in a way that wouldn’t have made sense—and wouldn’t have fit—on an iPhone or iPod touch. 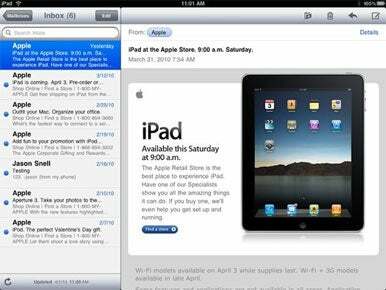 Many apps on the iPad—Mail included—take advantage of the tablet’s expanded screen real-estate with a split view in landscape mode. The device itself feels really fast. There are no delays when panning and zooming, even though you’re moving around lots more pixels than on the iPhone or iPod touch. Running Safari is a real joy, because you can pan and zoom with ease. 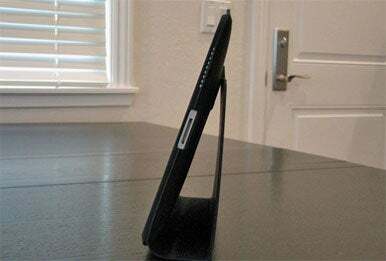 A case could be a critical iPad accessory, especially if it helps you hold the iPad at an incline. It’s hard to say what it will be like to use the device for an extended period of time, since we’ve only had it a few hours and have been passing it back and forth a bit. What I’ve picked up so far is that getting the iPad in the right position for watching a movie or typing is key, and it might mean that having a case for your iPad will be far more critical than having an iPhone case. For example, a case can give your iPad a slight incline in your lap so that it’s a bit easier for you to see and to type on. On a table, too, a little bit of an incline—or a dock!—helps a lot. Attaching the iPad to Apple’s Keyboard Dock proved that you can type at full speed and the Notes app won’t bat an eye. The Keyboard Dock is surprisingly heavy—presumably because it needs to counterbalance the iPad so it doesn’t fall over! Apple’s Keyboard Dock is heavier than it looks. But you can use it to type at full speed on the tablet. 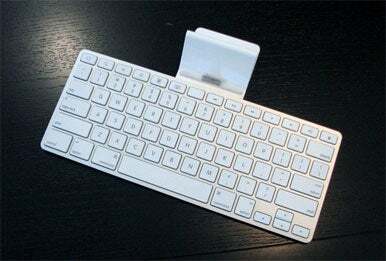 Pairing the iPad to a Bluetooth keyboard was also easy. We tried the Apple Wireless Keyboard as well as a MacAlly Bluetooth keyboard; both paired immediately and were just as responsive as the Keyboard Dock (although they’re missing the iPad-specific special-function keys of the Keyboard Dock; we’ll get into that more in an upcoming article on iPad accessories). Once again, though, you need to make sure your iPad’s on an incline somewhere or you won’t be able to see what you’re typing. iPad cases, mounts, and the like are going to be a huge market. We did notice some strangeness when we tried to plug the iPad into existing iPod or iPhone accessories. Some dock-based external speaker systems didn’t work. Some Macs and AC adapters we tried were able to charge the iPad; others caused the iPad to declare it was “Not Charging” despite it being connected and syncable. It turns out that the iPad has some very specific charging requirements. With the included 10-watt USB power adapter, it charges awake or asleep. On high-powered USB ports such as most recent Macs and the iPhone power adapter, it charges as well, though more slowly, according to Apple. On Macs and PCs without high-powered USB ports, the iPad will charge when it's sleeping, but when it's awake it will display that "Not Charging" message in the status bar at the top of the screen. Bluetooth headphones played just fine, though on-headphone controls didn’t control the iPad (as is the case with the iPhone). The controls on wired headphones, however, did work as expected. Although there’s no Voice Memos app on the iPad, the iPad can record, using compatible third-party apps, through both the internal microphone (found next to the Headphone jack at the top of the iPad) as well as the microphone on iPhone headsets. The new App Store for iPad is up and running, and by default it shows you iPad-only apps. Apps that run on iPad and iPhone alike are signified by a plus (+) symbol. You can also buy iPhone-only apps from the iPad, which run in the iPad’s iPhone-compatibility mode (that is, the app either runs very small in the center of the screen or blown up large, complete with some jagged pixels). We were able to use the existing iPhone/iPod composite and component adapters to connect to a widescreen TV. The images looked good, though a 1024x768 Keynote presentation was stretched to fit the 16:9 external display and we couldn’t force it to display black bars instead. When attached to the external display and running Keynote, the iPad displays slide controls and a slide viewer for skipping to any slide. If you press and hold on the screen, a “laser pointer” effect appears on the external display—very slick. However, we were sad to discover that presenter notes are not supported by the Keynote app, so if you rely on those notes to guide your presentation, you will be disappointed by this initial version of Keynote. Transferring files to and from the iPad is much easier thanks to the newly redesigned Apps tab of iTunes. Within the Apps tab, there’s a list of apps in a pane on the left, and a Documents window on the right. When you select an app, its associated documents appear to the right. You can drag these documents back out onto your Mac, and you can drag new documents into that window. They sync right away to your iPad. This system appears to be open to all third-party apps, so (for example) a PDF display app could accept PDF files, and presumably a comic-book reader could accept dragged-in comic files. The iWork applications are reasonably flexible about accepting and converting files. We were able to open a PowerPoint slideshow in the iPad version of Keynote and then edit the document. After making a few changes we returned to the My Presentations screen, tapped on the Share button, selected Export from the pop-over menu, and saved the document as a Keynote file (the other option is to export as a PDF—there’s no option to export back to PowerPoint). The document soon appeared in iTunes and opened perfectly in the Mac’s version of Keynote. Likewise, we copied a Word .doc file that contained a table to the iPad, and Pages opened the file with the text and table in place. However, we did have one Keynote file that refused to import, and we experienced a few minor issues with text layout in imported Keynote presentations. There’s so much to this product that we’ve only scratched the surface. Watch for more iPad updates on Macworld.com, and we’ll be posting answers to your questions later, with a full review to follow. Stay tuned.